I’d been thinking about peanut udon noodles for a few days before finally deciding to attempt to make it. A few years ago I had a bad experience with one of the processed peanut sauces that you make from a bag and pour over noodles. While it was theoretically good, I discovered the execution didn’t work the way I had planned. The sauce was rock solid and just slimy and disgusting. I hadn’t attempted a recipe similar to that until now! I did a quick google search and found this recipe on allrecipes.com which was nice. I used the recipe as a general outline but made my own changes/additions. I intended to use udon noodles in this but found that mine were moldy? I think someone spilled water on the box and didn’t try and clean them, so they were damp and eventually molded… So I used a mix of whole wheat spaghetti and quinoa spaghetti (which is delicious!). This dish can be made vegan and/or gluten free! You can prep vegetables/sauce while boiling water but prior to adding noodles. Boil a large pot of water and cook noodles according to directions. Cook until tender then drain the water. 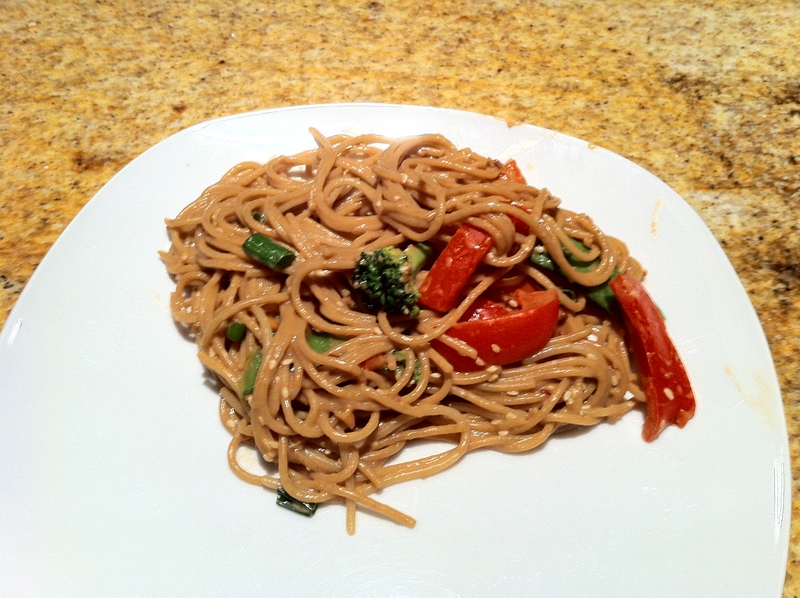 While noodles are cooking, make the sauce in a sauce pot and stir fry veggies in a frying pan. For the sauce: combine peanut butter, honey, chile paste, soy sauce, garlic, ginger, and broth in a saucepan. Cook on low heat until peanut butter has melted. Stir occasionally. While sauce is on low heat, you can stir fry your veggies. You can use oil or water saute the vegetables. Once noodles and sauce are ready, and water from noodles has been drained, combine. Add vegetables in after and mix until noodles and veggies are well coated in the sauce. Add sesame seeds and green onions then serve. We added the vegetables to make this meal less carb dense as well as a way to add some more fibre/colour to the dish. The sauce was so good. We found ourselves just sampling it constantly with the spoon. It was the perfect blend of peanut butter, spice, and saltiness. This dish can be vegan friendly (use vegan chicken broth and agave nectar rather than honey, also make sure pasta doesn’t include any animal products). It can also be gluten free (use a gluten free pasta like quinoa pasta, use tamari sauce rather than soy sauce)! This dish was a hit. It made a lot so we have left overs which is great. I’m looking forward to eating more of this. I think next time I may make a double batch of the sauce just so it’s really abundant! The flavours definitely shone through this dish. As a side note: I haven’t been baking very much! I’m planning on doing a bunch of baking soon though because of Valentine’s day coming up. I’m not sure what to make for Sean, he’s had a few requests. A part of me wants to just go crazy with it and make him a bunch of things but another part of me wants to hold onto my sanity. We’ll see which side wins!